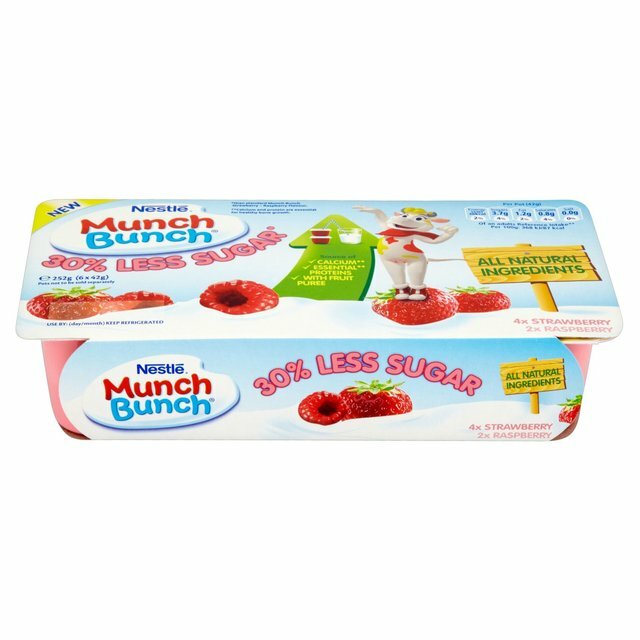 Made from a combination of all natural ingredients including fruit puree, Munch Bunch’s 30% Less Sugar range offers the same creamy forage frais as other popular Munch Bunch products, yet with 30% less sugar. Having first launched in February 2015, Munch Bunch’s 30% Less Sugar fromage frais small pots are now joined by a 30% Less Sugar big pot, with both products currently part of a ‘love the taste or your money back’ guarantee, promising a full refund if families are not satisfied with the taste. We are a yoghurt friendly family... well the boys are, I'm allergic to dairy, but hey ho. Sadly due to illness we missed a Munch Bunch cookery event in London this weekend, however we did go out and buy some. My kid's problem with yoghurts is, one is never enough, and the sugar content of yoghurts is just scary to look at. With the new 30% Less Sugar Big Pot now available, it means I can give him one and if the second is asked for I don't have as much to worry about. For further information visit www.munchbunch.co.uk and to join the conversation follow Munch Bunch on Facebook and Twitter. 30% less sugar than standard Munch Bunch strawberry and raspberry flavour fromage frais. 30% Less Sugar strawberry flavour big pots are available in Asda and online atOcado, - RRP £1.69 per 4 x 85g multipack. 30% Less Sugar small pots in Asda, Morrisons, Sainsbury’s, Tesco, Waitrose and online at Ocado, - RRP £1.59 per 6 x 42g multipack.